​​It's been done before. That DIY repair project that went horribly wrong. Someone thought it would be cost effective to slap on their own version of a rain gutter, only to discover that the seams were exposed, rust quickly formed, and the roof began to rot away due to water damage. And now? They're sleeping in the dog house... Sure, that may be a worst-case scenario, but why risk it? Wouldn't it be better to consult the experts? 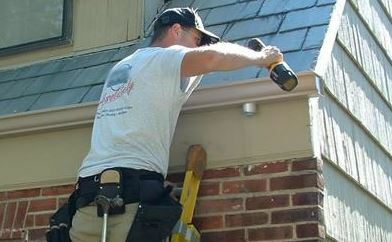 At Elkhart Gutter Pros we know the best job is the one completed by those with the most knowledge and experience. Which is why we're considered one of the best gutter companies in Elkhart. we take care of our clients by not only sharing their extensive product knowledge but also with quotes for installation of gutters, DIY tips for cleaning and seamless repairs. By offering an extensive list of help and information for our customers, Elkhar Gutter Pros can insure that any job taken on, is one done well and to absolute precision. Though a homeowner may never wish to face any kind of gutter repair or replacement, the day will come. As with any home, maintenance is required in order to assure that the home remains standing and strong for many years to come. And the two key places a home needs to be sturdy? The foundation, and the ROOF. But gutters aren't part of the roof you say? Technically, they are one of the most crucial pieces to ensuring your home remains strong. Without gutters to protect the edges of the shingles or the roof frame, water will seep in and begin to rot away the wooden trusses that are supporting the roof of your home. Pair that with the ripple effect water damage will have on your shingles, and voila! Thousands of dollars worth of repairs are needed. Which is one of the biggest reasons to have a professional install and maintain your gutters. ​At Elkhart Gutter Pros we know how special a home can be, and they want to assure their clients that no matter the issue, they will deliver perfection. Because, when it comes to being the best gutter company around, we know what it means to take care of their customers. Not to mention that at Elkhart Gutter Pros we offer gutter installation estimates and costs for replacement parts, a full panel of DIY installation instructions (along with pro tips from our experienced staff), and we will even break it down so you can receive the cost per linear foot; specifically designed for those times when an ounce of prevention is worth a pound of cure. On top of our pristine work as gutter professionals, the staff at Elkhart Gutter Pros also wants to assure our clients that they are the leading experts in their field. Whether you're looking to replace, reinstall, update or simply protect your home with new gutters - we have everything you need.